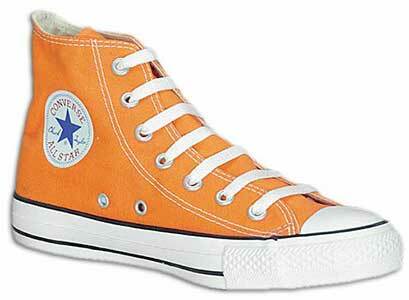 Make a statement with orange high top chucks. For a week or two after the intervention, I was happy. I had an Interview. I was back in high school at prom time. Saying you were going to the prom was always better than the prom itself, which required you to wear uncomfortable clothes and talk for hours in a dark gym. At last, the pregame jitters set in. I start to gnaw on my knuckles — a good sign. What if I don’t get this job? What if Spud just likes me for my chucks? What will we talk about? Should I stand up and announce, “I’m more than my shoes!”? And if I am more than my shoes, what exactly am I? 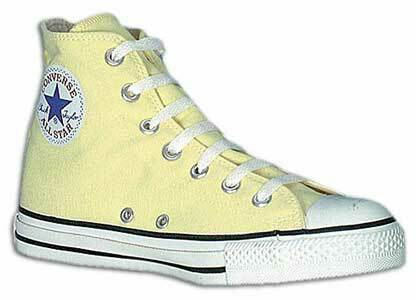 Wear your yellow high tops with attitude!